We’re in the thick of the holiday season. Shopping is probably inevitable for a lot of us. If you or someone you know thinks Spider-Man is pretty cool but is clueless as to what to read first, I’ve put together a great big list as a checklist or reading order guide. Marvel Comics has been publishing The Amazing Spider-Man since 1963, so being a little overwhelmed about what to get is understandable. Peter Parker (right) is pretty confused by it all too. And he’s lived through it. So, here’s my Reader’s Guide to Amazing Spider-Man with every graphic novel that’s been published from that comic book series, what’s inside, and in what order you should read it. I’ve also included cover prices and if there are alternate ways to get the stories (soft cover, hard cover, etc.). After the list, I’ve also included a recommended reading list if you’re only interested in the most universally loved material instead of everything. Please feel free to join in the conversation if you have any favorites, questions, corrections or suggestions. 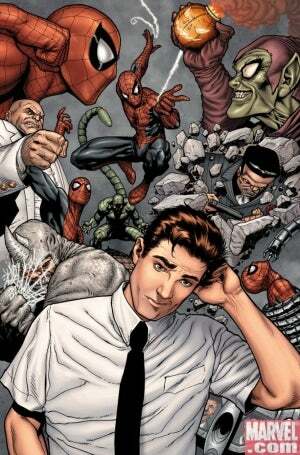 Just a note for those of you Spidey-savvy enough: this list only focuses on the Amazing Spider-Man comics series from 1963 to present, and for the most part does not include spin-offs like Web of Spider-Man or the relaunch series like Ultimate Spider-Man or Marvel Adventures Spider-Man (both of which are great ways to read Spider-Man too but they exist in their own universe apart from Amazing Spider-Man, and as such, they’re pretty streamlined, self-contained and easier to figure out where to start – although if you’re not sure, post a comment or email and I’ll be glad to help out). I’ve also got similar Reader’s Guides to Uncanny X-Men and Fantastic Four. And I’ll be posting more here as time allows. Any requests for comic book series to cover?